Fuji apples were, once upon a time, objectively and irrefutably the most delicious apples you could sink your teeth into—anyone who said otherwise was either a liar or a witch. These days, though, Fuji apples just aren't quite hitting the spot like they used to, and we might never see them reach their former glory again. By comparing samples of modern-day Fujis to similar studies from the 70s, a team of researchers has discovered that the formerly glorious Fuji has recently grown substantially mealier and has a lower flavor concentration. The likely culprit? Our old friend climate change. Coming from Japan, the researchers actually compared both modern-day Fujis and modern-day Tsugarus to their healthier, presumably groovier 70s counterparts. 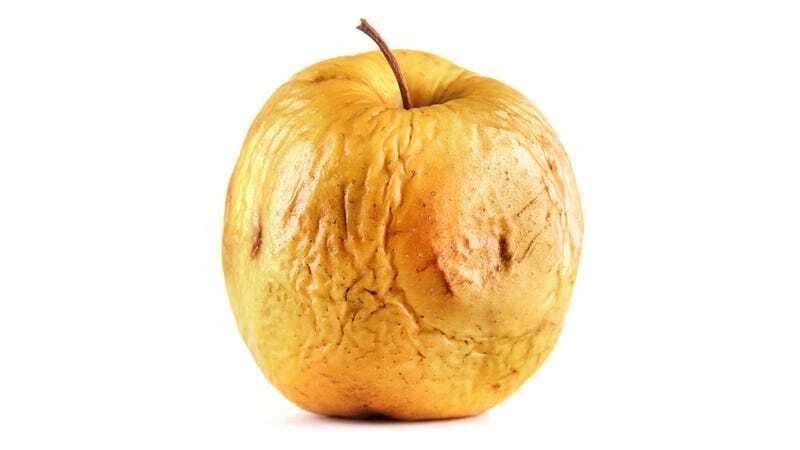 They found that the concentration of malic acid—which is a large part of what gives apples their taste—has been slowly declining over the past few decades along with the apples' firmness. What's more, today's apples are far more suspectible to watercore, a disease that causes apples to start breaking down internally as soon as they mature. So on top of everything else, today's apples are more disease prone, too. Tasty. Wanting to find a cause for the disgrace to Johnny Appleseed's legacy, the team looked at the long-term climate trends in Japan's two apple-growing regions, Nagano and Aomori. During the past 40 years, temperatures in both locations rose about 3.5 degrees Fahrenheit, and the rise in temperature correlated with the increasingly earlier dates on which the apples would flower. While this could potentially all just be a coincidence, other studies conducted in controlled chambers have shown that higher temperatures directly relate to a decrease in taste and texture.